Temporal strategies extend decisions over time, for instance by delaying decisions (postponement), reconsidering provisional decisions later on (semi-closure), or partitioning decisions for taking them stepwise (sequential decisions). These strategies allow the decision-makers to use further argumentative methods to learn about, evaluate, and account for the relevant uncertainties. However, temporal strategies also open up opportunities for eschewing the decision problem. 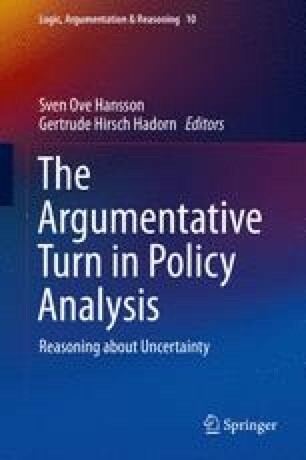 I propose four general criteria that serve as a heuristic to structure reasoning for and against the application of temporal strategies to a decision problem: the relevance of considering uncertainties for taking a decision, the feasability of improving information on or evaluating relevant uncertainties; the acceptability of trade-offs related to the temporal strategy, and the maintenance of governing decision-making over time. These criteria need to be specified and weighted in each case of application. Instead of determining a temporal strategy, the criteria provide a framework for systematic deliberation. Dietz, T., Ostrom, E., & Stern, P. C. (2003). The struggle to govern the commons. Science, 302,1907–1912. doi: 10.1126/science.1091015. Parson, E. A., & Karwat, D. (2011). Sequential climate change policy. WIREs Climate Change, 2, 744–756. doi: 10.1002/wcc.128. Andreou, C. (2012). Dynamic choice. In E. N. Zalta (Ed. ), The stanford encyclopedia of philosophy. http://plato.stanford.edu/archives/fall2012/entries/dynamic-choice. Accessed 2 Jan 2015. Betz, G. (2016). Accounting for possibilities in decision-making. In S. O. Hansson & G. Hirsch Hadorn (Eds. ), The argumentative turn in policy analysis. Reasoning about uncertainty (pp. 135–169). Cham: Springer. doi: 10.1007/978-3-319-30549-3_6. Brun, G., & Betz, G. (2016). Analysing practical argumentation. In S. O. Hansson & G. Hirsch Hadorn (Eds. ), The argumentative turn in policy analysis. Reasoning about uncertainty (pp. 39–77). Cham: Springer. doi: 10.1007/978-3-319-30549-3_3. Doorn, N. (2016). Reasoning about uncertainty in flood risk governance. In S. O. Hansson & G. Hirsch Hadorn (Eds. ), The argumentative turn in policy analysis. Reasoning about uncertainty (pp. 245–263). Cham: Springer. doi: 10.1007/978-3-319-30549-3_10. Edvardsson Björnberg, K. (2016). Setting and revising goals. In S. O. Hansson & G. Hirsch Hadorn (Eds. ), The argumentative turn in policy analysis. Reasoning about uncertainty (pp. 171–188). Cham: Springer. doi: 10.1007/978-3-319-30549-3_7. Elliott, K. C. (2016). Climate geoengineering. In S. O. Hansson & G. Hirsch Hadorn (Eds. ), The argumentative turn in policy analysis. Reasoning about uncertainty (pp. 305–324). Cham: Springer. doi: 10.1007/978-3-319-30549-3_13. Grüne-Yanoff, T. (2016). Framing. In S. O. Hansson & G. Hirsch Hadorn (Eds. ), The argumentative turn in policy analysis. Reasoning about uncertainty (pp. 189–215). Cham: Springer. doi: 10.1007/978-3-319-30549-3_8. Hansson, S. O. (2016). Evaluating the uncertainties. In S. O. Hansson & G. Hirsch Hadorn (Eds. ), The argumentative turn in policy analysis. Reasoning about uncertainty (pp. 79–104). Cham: Springer. doi: 10.1007/978-3-319-30549-3_4. Hansson, S. O., & Hirsch Hadorn, G. (2016). Introducing the argumentative turn in policy analysis. In S. O. Hansson & G. Hirsch Hadorn (Eds. ), The argumentative turn in policy analysis. Reasoning about uncertainty (pp. 11–35). Cham: Springer. doi: 10.1007/978-3-319-30549-3_2. Möller, N. (2016). Value uncertainty. In S. O. Hansson & G. Hirsch Hadorn (Eds. ), The argumentative turn in policy analysis. Reasoning about uncertainty (pp. 105–133). Cham: Springer. doi: 10.1007/978-3-319-30549-3_5. Oxford English Dictionary (OED). (2014). strategy, n. Oxford University Press. http://dictionary.oed.com/. Accessed 10 Sept 2014. Tigges, R. (2011). Moratorium 2011 – Das Schicksalsjahr für deutsche Atomkraftwerke: Aufbruch zu einer neuen Energiestrategie für unser Land? http://www.moratorium2011.de/. Accessed 10 Sept 2014. UNFCCC, United Nations Framework Convention on Climate Change. (2008). Challenges and opportunities for mitigation in the agricultural sector (Technical paper no 8). http://unfccc.int/resource/docs/2008/tp/08.pdf. Accessed 2 Jan 2015.